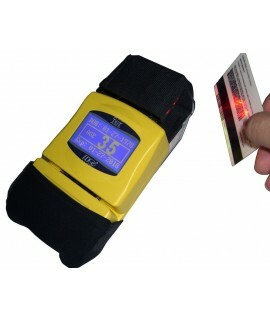 Instantly scan magnetic stripe & 2D barcodes for ultimate protection. Designed for wall mount or countertop use. Stores 4,000 records for compliance purposes. Priced much lower than our competitors. Help spot fake ID's, expired ID's, and underage consumers with our Premier Age Verification ID Scanner with barcode reader. This is the ideal product to increase the efficiency of your employees, help check ID's properly, and reduce the "human error" factor. Manually checking ID's just takes too long, and mistakes are bound to occur. It is essential that all businesses associated with age restricted items implement a professional approach, as the risks of large penalties, suspensions and loss of licenses are simply too high. 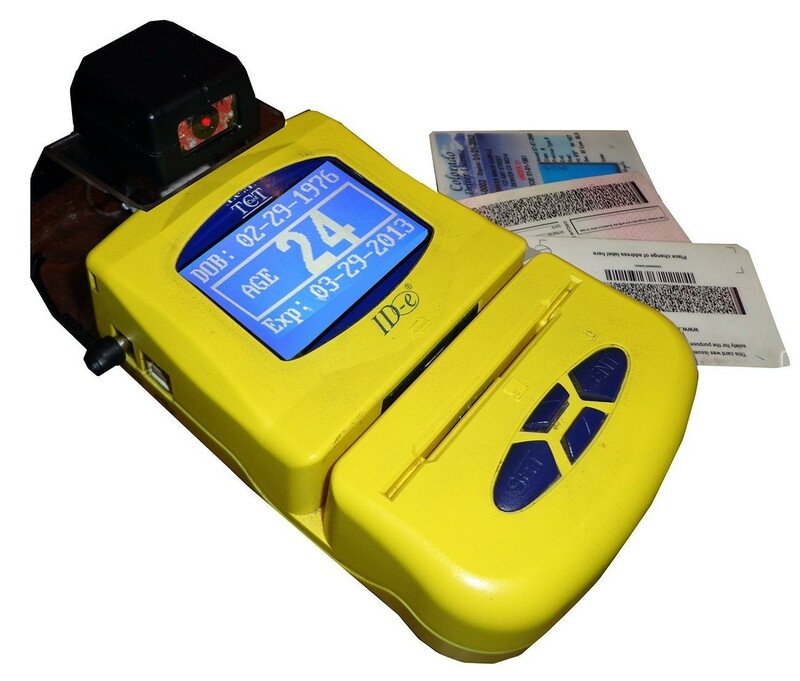 The Premier Age Verification Terminal with barcode reader is the ideal solution, and this model works with all magnetic stripe ID's and 1D/2D barcodes. Furthermore, we strongly recommend the optional software for compliance purposes, which enables you to download and store the previous 4,000 ID scans for regulatory purposes. Upload data to an Excel Spreadsheet for customer information. You may care to add the "banned customer" feature, so that you can identify problem customers, right at the door. This ID scanner is extremely easy to use... the terminal operates via plug for desktop/counter use or batteries for handheld mobile convenience. 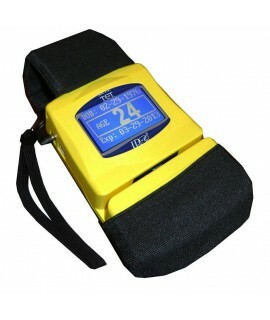 This model comes complete with wrist strap, AC/DC power supply and 2 AA batteries. Colors Available: Yellow or Black. 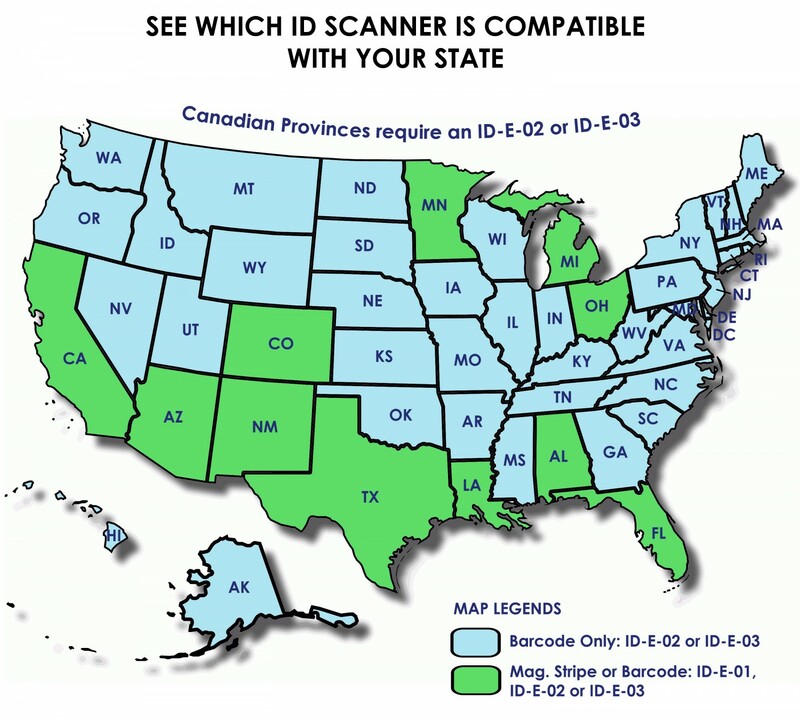 Reads ID States and Driving Licenses from all 50 States & Canadian Provinces. Internal memory stores up to 4,000 scans. Unit ready to be used out of the box. No Setup required! Standalone scanner: no telephone line or computer cable required. Display age, DOB & expiration date when ID is scanned. Review customer's data directly on the scanner. Optional Compliance Software to store raw customer data of last 4,000 scans. 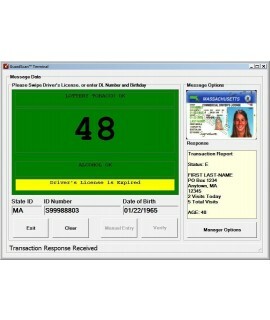 Optional BAN/VIP Feature to flag your customer's driving license. This product is just wonderful! Have had no age issues since I purchased it. I would recommend this product to anyone who needs an age verification product! Thanks again for a wonderful product! This machine has already paid for itself by stopping a sting. 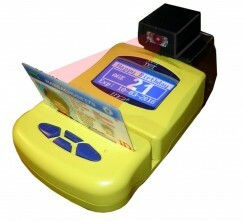 The scanner is easy to use and saves the time trying to figure out a person's age. 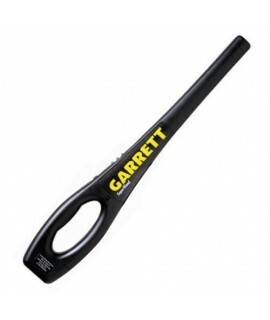 Great Product & Easy to Use!!! We have been using the ID-E-02 for almost a year now in our Lobby Bar. 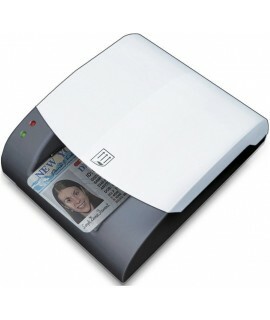 Not only is this ID Scanner a great product, it is easy to use. 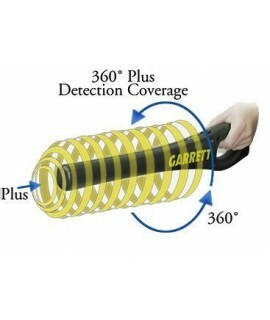 The website is very explicit making it easy to decide which scanner is best suited for your establishment. A definite MUST for any establishment that caters to adults only. I don't worry about checking ids now. I insert the card and BOOM, there it is. Don't have to second guess or search out of state IDs for birthdate and expiration, it is displayed on the screen. Nice and to the point scanner. So far works good, happy with it. Extremely helpful sales person. Answered all of my questions. ID Scanner is ready to use. No programming and no maintenance. Suits my needs perfectly. It has help us to protect our business from fake IDs our family own a grocery Store and we’ve had some problems with teenagers under 21, so now we run all IDs through the machine. We have it at the counter and used with everybody It solved the problem for us and we are very satisfied. Just what the doctor ordered. Turned away 4 students in first 2 weeks. Thank you. I own a food mart and I’ve had some problems with teenagers under 21. My staff were making some mistakes so now we run all IDs through the machine. We have it at the counter where people can see it. It solved the problem for us and we are very satisfied. The compliance software enables you to download and store raw customer data of the previous 4000 scans. Your investment in this software could help protect you, and your business. An example of this scenario, is as follows: Customer A purchases and consumes 6 beers and then gets into a serious accident. It turns out that Customer A is only 19 years old and had used his older brothers ID (who is 24 and looks very similar) to purchase the beer. The police investigate and Customer A tells the police that he bought the beer from your location. With this software, you have evidence that, although he did purchase the beer from your business, your employee took steps to verify that the customer was over 21. The BAN/VIP feature will alert you if a specific individual is attempting to gain access. Some of our customers use this feature to identify banned customers, while others use it to identify VIP's. Either way, this is an excellent feature to help remember specific individuals, whether they are VIP's or troublemakers.